Land surveyors measured a Manitoba snow maze to determine if it’s big enough to break a Guinness World Record on Sunday. 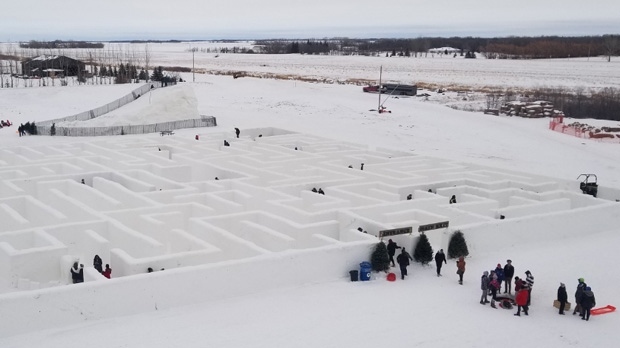 A Maze in Snow is located about 25 minutes south of Winnipeg. Surveyors calculated the number of square metres of the labyrinth and used a scanner to make a 3D model to submit as evidence. “I would treat this measurement like all stuff that I would measure. We’re professional, so we have to treat it all the same, it’s very serious,” said Mike Sippola with Barnes & Duncan Land Surveyors. 300 semi-trucks worth of snow were used to make the tightly packed snow walls. The maze takes about 30 minutes to wind through. Owner Clint Masse said when the maze opened in January, business was booming, but the extreme cold keeps crowds away. “It’s derailing except the hardest core Manitobans. I think when we get back to that minus seven to minus 10 stuff we’ll see more international visitors show up,” said Masse. Masse said the initial findings from the land surveyors show the snow maze is more than 2700 square metres and surpasses the current world record holder in Thunder Bay, Ont. by a significant margin at about 1600 square metres. He hopes to get the final word from Guinness World Records next week. The maze’s creators hope getting the designation of having the world’s largest maze will bring more visitors. Already they say people have come from as far as South Africa and Europe. Nancy Sarsfield is from Halifax and is visiting Manitoba for the first time. She said the snow maze is a draw for her to get outside and experience winter. “I’m impressed with how it’s built. Looks pretty incredible,” she said.